New muscle at Lanvin? 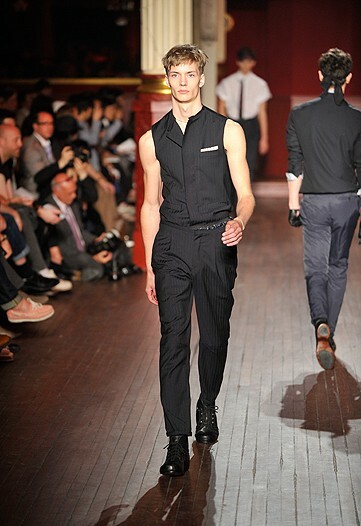 A look from Lanvin's SS10 men's collection. Turns out that the investor/buyer of that 12.5% stake the company sold last November could be Ralph Bartel. He’s the Chairman of Travelzoo – the online travel firm in New York. Interesting, given the digital dipping that is going on by all the luxe brands these days. As per WWD, Bartel could not be reached for comment and Lanvin declined all comment. Second, a similar denial at Prada. There were rumours that the company was selling a stake to Compagnie Financière Richemont SA. Don’t know Richemont? But you do know Van Cleef & Arpels, Cartier and Chloé, yes? That’s them. Prada says non è vero (not true). Richemont says they don’t comment on rumours. Lanvin image courtesy of The Fashionisto, Prada image courtesy of Flairvoyant.